This spring semester has given me the opportunity to assist with the College of Arts & Sciences in recruiting students to the University of Nebraska-Lincoln (UNL). I have assisted in our Red Letter Days as well as meet with students for their academic meeting portion of their campus visit. A small part of my job description is to meet with prospective students and to assist with the recruiting of students during recruitment events – something out of the box for my typical day-to-day duties. However, with my increased involvement this semester I have found myself enjoying this world of student affairs and the bubble that is recruitment. 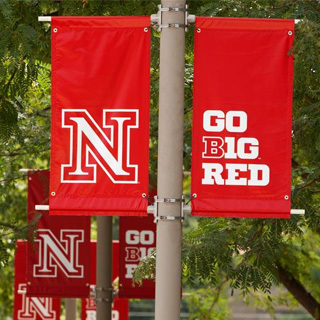 Red Letter Days are days specifically for juniors and seniors who have not visited UNL before, and my involvement is during the Arts & Sciences college session. Students and their parents attend two different college sessions to learn more about a college and receive a brief overview. Our college presentation is led by Jodi, our Director of Recruitment, and is focused on the college’s main message – let curiosity move you, and Academics + Experiences = Opportunities. We focus on telling students “study something you love”, receive a customized degree with majors and minors, and that you do not have to know where you want to go to get started. My favorite part of the college session is the second half when we break into academic discipline areas (natural sciences, humanities/social sciences, and computer science) and have a discussion led by an advisor and student ambassadors from that discipline area. The students (and parents) get to hear current students and their experiences both in and out of the classroom – class size, working with professors, study abroad, etc. I have loved getting to hear from our student ambassadors and hope that prospective students get excited about the possibilities they could have in coming to UNL. For students who are further in the search process, they visit campus and get to meet one on one with an academic advisor to learn more about their potential program. This semester I have had three campus visits – two for Anthropology and one for Political Science. I love hearing about students – why Nebraska, what interests them about their major, and what their experience might be like. Since my day-to-day work focuses on students currently here, I love the opportunity to see students in this pre-college stage. It reminds me of how stressful it is picking a college and picking a major, but also a time of excitement at the possibilities that the future holds. While I certainly do not have the skills, or the WOO strength, to be in the world of recruitment or admissions, I do enjoy getting to step into this world every once in a while.